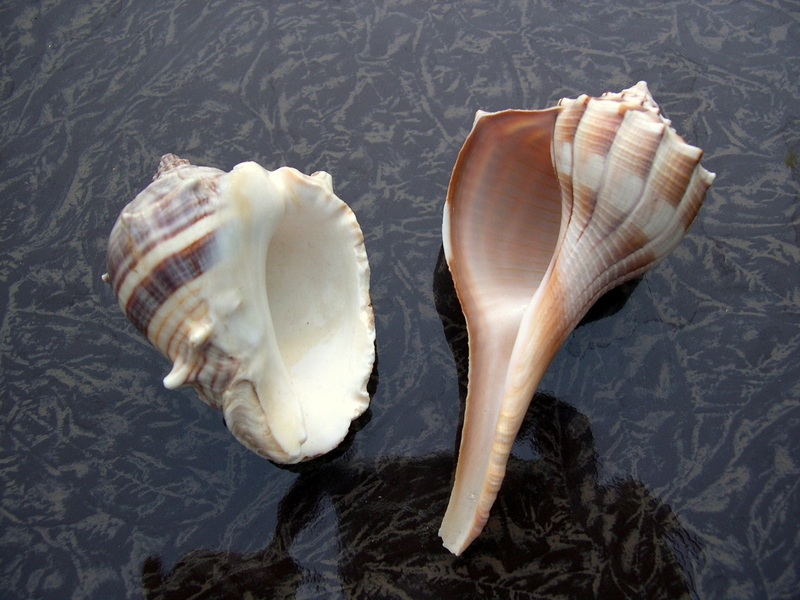 On a trip to Sanibel Island, on the Gulf coast of Florida, in 1991, we were able to find many lightning whelk shells. Most of them were inhabited by the mollusk and were easy to spot moving about on the sandy ocean bottom. I had no idea what I was collecting when I picked up the 4 inch long shell, but I knew it was a beauty and I felt lucky to have found it. I lived closer to the east coast of Florida where I’d never seen a shell so lovely. It was long and had beautiful streaks of brown running the length of it and the spiral on top was gorgeous. I added it to my seashell collection and didn’t think too much about it. I now know that it is a Florida Lightning Whelk and that it is known as being sinistral, or left-handed. When holding the shell at the pointed end, or bottom, you can see that the opening, or aperture, is on the left side. My photo to the right, shows my lightning whelk next to a crown conch to show what I mean. My reference book, the National Audubon Society’s Field Guide to Shells says that this shell can be up to 16 inches long. It’s not difficult to find information and pictures on-line of this popular shell and if you are looking for more just google the name. If you get to visit any of the warm water beaches between North Carolina and Texas, you just might find a living lightning whelk. 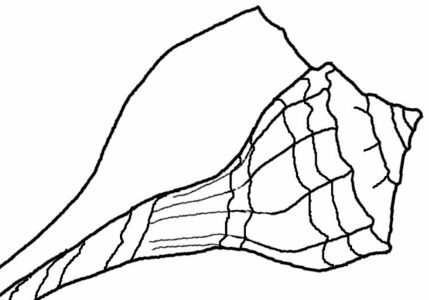 Lightning whelks (Busycon contrarium) eat mostly bi-valves (shells with 2 halves) and especially love clams which they pry open using their strong “foot”. 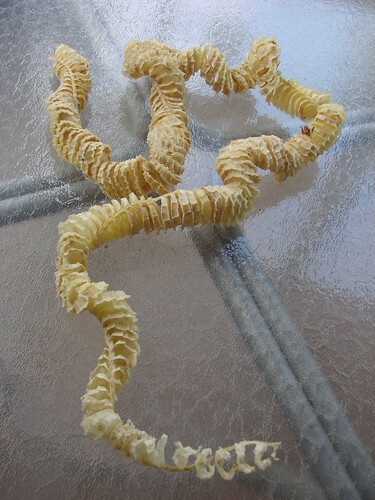 A lady at Flickr has an interesting photo (below) of a lightning whelk egg case. If all of these babies had hatched, that would be a lot of new lightning whelks. Please click this link to read what “biggertree” has to say about her photo below. Just wanted you to know that I am really enjoying the photos of your shells. I collected shells in the 1980’s and had a lot of fun. Thanks, I’m glad to hear that. Do you have any favorite shells in your collection? it’s hard to have any one favorite. We (hubby and I) have a Wentletrap that we are proud of and also a trident’s trumpet, golden cowrie, a venus comb. Maybe for sentimental reasons it might be a geography cone that hubby very carefully brought to shore one day while scuba diving. I really enjoyed the video you embedded of the live geography cone. Wow, you have a nice collection of shells. Diving has always interested me, and what a great way to find unique seashells.